I was contacted by a national publishing house representative last week requesting I offer images for review for a new book featuring future NFL Hall of Fame inductee Peyton Manning. Manning spent fourteen years with the Indianapolis Colts before the club decided to look to the future for a younger quarterback and subsequently declined to renew his contract. Manning spent an entire season rehabilitating an injured neck that required four surgeries. Confident his career was not over Manning pursued new employment and within a short period of time became game-fully employed last season acquired by the Denver Broncos as an unrestricted free agent on March 20, 2012. As team photographer, at approximately 10 a.m. on that very date I began to document a new chapter in Peyton’s illustrious career. As I began my photo research the other day one particular photo, though rather mundane, stood out. It was a captured moment of the man who epitomizes professionalism and integrity of the National Football League rubbing his jaw with a sense of anxiety and an expression of uncertainty. He was attending the team’s first off season workout at the Broncos training facility. One can only imagine how awkward and uncomfortable it must have been for the person who for fourteen years was in total control of his work environment and his destiny now starting over in completely unfamiliar territory. As we all know Manning adapted very quickly and the rest of his story is yet to be written. 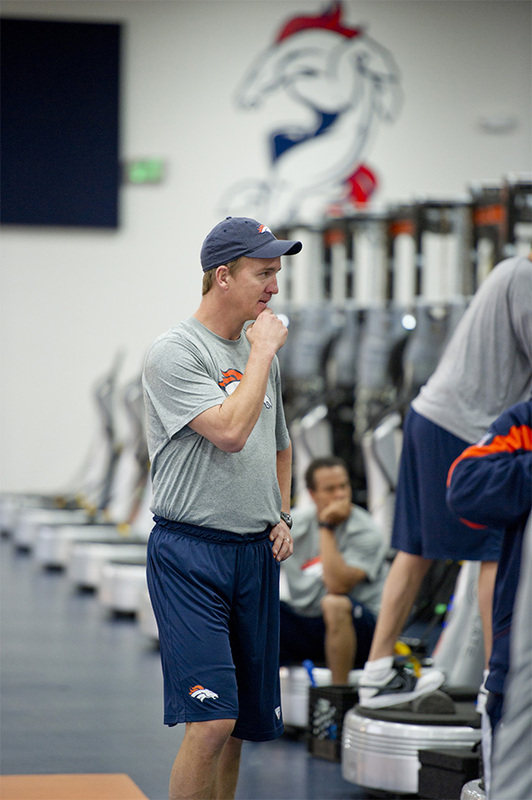 Newly acquired unrestricted free agent Denver Broncos Peyton Manning in the training room on the first official day of offseason training at the Dove Valley facility April 16, 2012 in Englewood,CO.